I’m excited to try roasting berries for smoothie. Never would have thought of that! My dairy free smoothie- 1/2 cup unsweetened almond milk, 1/2 cup cold green tea, 1/2 banana, 3-5 good size frozen strawberries, 1 scoop pea protein powder, 1large kale leaf ( I buy a bunch, wash and freeze in ziplock bag) pea protein makes a thick shake, I’m totally hooked on! Just a question about the "1-1/2 cups fresh strawberries" part: does that mean "one and a half cups", or "one to one-half cup"?! In your blender or in my case the Magic Bullet add all of your ingredients then blend. It may take a while because the fruits are frozen. Once everything is moving free your smoothie should be ready. Green Smoothie: 1 apple, 1 pear, 1 lemon (no peel), chunk of ginger, bunch of kale + water to fill line… Blend till smooth & enjoy! My go to smoothie is frozen strawberries, some fresh strawberries, banana, almond milk, spinach and my chocolate protein powder! So good!! Fingers crossed! I am just starting to get into green juice/smoothies! kale, spinach, lemon, ginger and apples… toss in a little cayenne! Yum! My favorite smoothie right now is spinach, kale, cucumber, cilantro, peaches, chia seeds and fermented grass. I am not a big spinach fan but I tried a green smoothie and loved it! Just spinach, banana, peanut butter, milk, and yogurt. yummy! Almond milk, blueberries,handful of super greens,almonds,avocado, cinnamon, stevia, pineapple,ground flaxseed. 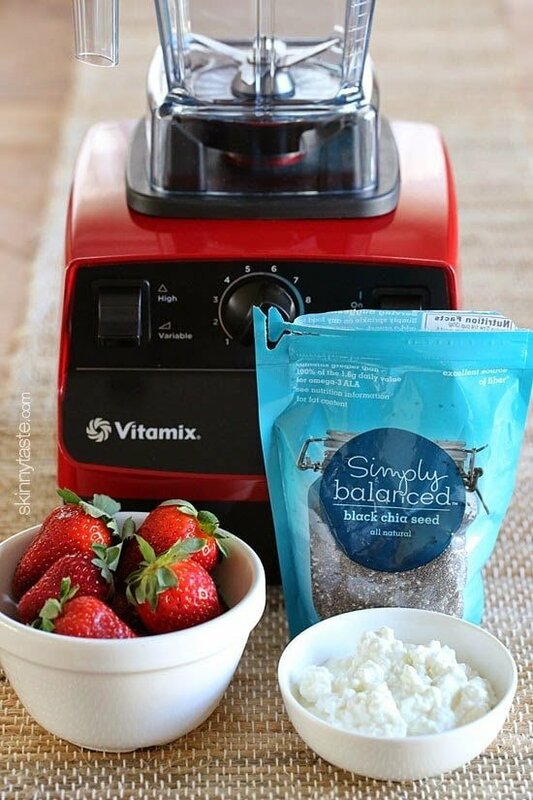 I'd love to win a Vitamix……….I'd make a fresh berry smoothie with mixed berries, yogurt, and ice. berries of all kinds, coconut milk and ice. That looks amazing! I have been coveting a Vitamix. Handful of kale, tablespoon of peanut butter, 1 scoop chocolate protein powder, chia seeds, handful of almonds and water or almond milk. Green smoothies are a daily staple in our house. I don't know if I have a favorite, but a go-to recipe is spinach, a frozen banana, frozen pineapple, a cup of unsweetened vanilla almond milk and water as needed for consistency, chia seeds and shelled hemp. Give it a whirl and voila! We make green smoothies every day. I don't know if I have a favorite, but this one is a staple. Spinach or kale, a frozen banana, pineapple, chia seeds and hemp protein plus 30 cal vanilla, unsweetened almond milk and water. Give it a whirl in the blender, and voila! Anything with bananas and chocolate! What a great giveaway, who doesn't love target and one of the most amazing blenders?! Strawberries, oranges, a banana, carrots and maybe a bit of kale! Can't wait to try chia seeds! This was so good. 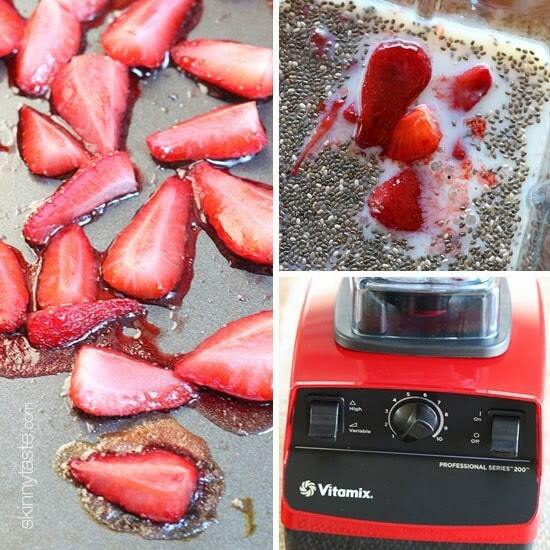 I loved how roasting the strawberries made them taste so much more intensely…strawberry-ey! lol I added a frozen banana instead of using ice. My husband and 4 y/o loved it too! Do you think you could freeze the roasted strawberries in their juice for smoothies etc later? Strawberries are a great price right now but I'm always battling freezer burn when I just pop them in freezer bags. I thought this might help them last longer and then I could do a bunch without having to roast them for every smoothie. My favorite smoothie is: Almond Milk, Banana, Peanut Butter, ice and spinach. 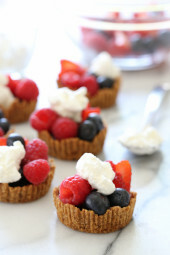 I dont have a very good blender, but my fav reciepie is as simple as bananas and strwberries with a hint of vanilla! I have a breakfast smoothie every morning with oatmeal and I would love to have a blender that works as amazing as this one does!! I need this! Orange Juice, Kale, Banana, Carrot, Apple, and occasionally Pomegranate seeds. We have this every morning! Love it! One of my favorite, more unusual smoothies is an orange/beet smoothie. Take an entire peeled orange and a chopped beet and blend it with water, ice, and sweetener (optional). It's SUPER healthy, a beautiful color, and such a unique taste! Baby spinach, banana, frozen strawberries, greek yogurt, hemp seeds and frozen bluberries. I like a simple green smoothie. % cups of spinach, coconut milk, a banana, and frozen mixed berries. Does anyone think it's a bad idea to post your email for anyone to see? Seems like this would make a prime opportunity for someone to run a phishing scam by sending emails telling people they've won. All of your recipes are so brilliant. Your all information is very well founded and presented in such a convincing way. I have found many blogs on this subject, but by far, yours is the best. Regards for sharing. 1 cup vanilla yogurt, 1 cup orange juice, 1 banana, 2 cups frozen berries, 1 cup ice. My favorite ingredients for smoothies are ; frozen fruit, greek yogurt, flax seed and almond milk. Yum! My current favorite is silken tofu, almond milk, a scoop of vanilla protein powder, a handful of frozen blueberries, and a BUNCH of spinach. Ugly but delish. Kale, banana, o.j., frozen fruit,a greens powder, and coconut oil. Superman in a glass! [email protected] Kathryn Wood. 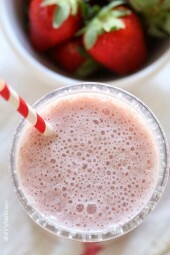 I LOVE your PB and J smoothie recipe!! So tasty! My favorite smoothie is Chocolate PB Banana Milkshake. Frozen bananas, peanut butter, honey, cocoa, peppermint extract, vanilla extract, almond milk, sea salt. It's like a Thin Mint milkshake and completely healthy! That looks so good, I'll definitely have to try it! I love strawberries. I might mix in some mango pieces too because I'm on a big mango kick right now, haha. My favorite smoothie right now is pretty simple: pb2, banana, vanilla protein powder and almond or coconut milk. Sooo tasty! This would be so great. I would make more smothies. I've never had roasted strawberries–interesting! My fave smoothies are protein powder, almond milk, frozen cherries (the BEST fruit for smoothies), and sometimes some peanut butter powder and agave. Super yum! Sometimes I throw in Spinach too. Go to smoothie is always your green smoothie. Everyone including the 1 year old and 3 year old loves it. Helps me feel good about getting the greens in first thing in the morning. I also add Chia seeds in addition to the frozen bananas, grk yogurt, PB, spinach and almond milk. My favorite is the Green Monster Smoothie! 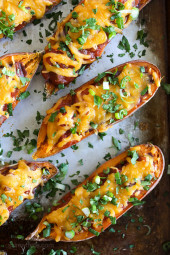 I like this recipe it's a little different. But you can't go wrong with a handful of spinach, banana, strawberries, and yogurt smoothie. Plz contact me at [email protected] if I win. I hope I'm not too late!! I just do a handful of frozen fruit, chia seeds, kefir, filtered water, a little juice (any kind), and fill it the rest of the way with spinach. Sometimes I throw in fresh fruit that I have on hand or half of an avocado. Whatever sounds good! Ginger, Frozen sliced Peaches, honey, greek yogurt, almond milk, chia or flex seeds and spinach! My favorite smoothie is your blueberry banana oatmeal smoothie. My protein yummy: 3/4 c. liquid egg whites, 1/2 c. chocolate almond milk, 1 T. almond butter, 1/2 frozen banana. It is so good! Oooh! I've always wanted a vitamix! Here's my favorite smoothie: Almond milk, peanut butter, 1 frozen banana, chia seeds – tastes like heaven! I love a frozen banana (pre-sliced), a scoop of vanilla protein powder, a cup of ice, a cup of water & a tbsp. of cocoa powder. It's like a milkshake! I love love love Kimberly Snyder's Glowing Green Smoothie! I love smoothies, and have one each morning for breakfast! My basic recipe is 1 cup fruit, 1/2 banana, 1 cup spinach, 1/2 cup kefir, 1/2 cup almond milk, and 1 tablespoon ground flax. Sometimes I add a little bit of avocado too. YUM! Frozen banana, chocolate protein powder, spoonful of almond butter, and almond milk. So delicious and nutritious! I am a green smoothie freak! My favorite is super simple- 1 cup almond milk, one cup kale, 1 cup raspberries, 1 banana, 1 cup blueberries, handful of choc chips for fun! 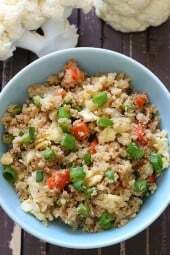 Makes 1 3/4 cup serving and is 189 Calories.